This is the updated flier. Bike Polo. 8 teams from Dayton, Columbus, Cincy, Springfield and NYC. Double elimination, first round 3 points or 15 min. after that 5 points or 15 min. This entry was posted by Doug D on May 7, 2008 at 8:54 pm, and is filled under Bike Polo, Events-Past, Ohio. Follow any responses to this post through RSS 2.0. You can leave a response or trackback from your own site. I’ll be there and by the looks of it they might have a frame in the prizes (Villin Bikes is a frame company in FL) but maybe not or they would be higher on the list of sponsors. 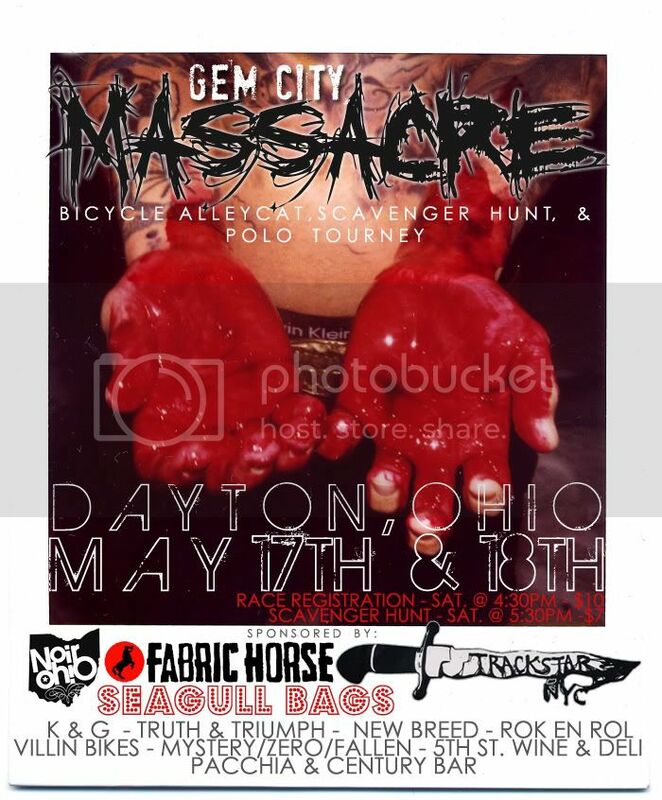 Tell me why I should travel to Dayton? They flaked on two consecutive weekend tourneys for which they had personal invites and plenty of lead-time. I like those guys and girls and especially that court, but I’m not feeling enough love to justify the drive right now. to the chicago crew. lucky and ben. dont let the flakes of dayton represent the scene as a whole. i was living with doug when you came thru the first time. and im everseeing the race this year in dayton, it is going to be fun. and like you said the court is awesome. there will be polo prizes. a frame is not one of them, i couldnt make it happen. in all honesty i really want alot of out of towners to come here and show this uninformed polo scene what it is really like to compete at a top level. dayton likes to talk the talk, make them walk the walk. Wasn’t you last kid born during or very soon after a tournament? I remember talk of naming the beast “Chukkar”. I’ll ask the StL kids this Sunday. If we can get a car together, we’ll try to go. If only to call Elton a flake to his face.